© 2010 - lOS Press and the authors. All rights reserved. á-Amino-3-hydroxy-5-methyl-4-isoxazole-propionic acid receptors (AMPARs) are key regulators of synaptic function and cognition. In Alzheimer's disease (AD), cell-surface AMPARs are downregulated, however the reason for this downregulation is not clear. 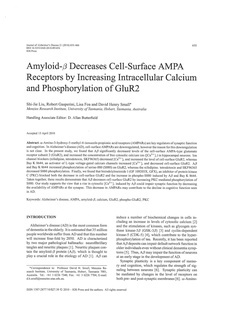 In the present study, we found that Aâ significantly decreased levels of the cell-surface AMPA-type glutamate receptor subunit 2 (GluR2), and increased the concentration of free cytosolic calcium ion ([Ca2+]i) in hippocampal neurons. Ion channel blockers (nifedipine, tetrodotoxin, SKF96365) decreased [Ca2+ and increased the level of cell-surface GluR2, whereas Bay K 8644, an activator of L-type voltage-gated calcium channels increased [Ca2+]i and decreased cell-surface GluR2. Aâ and Bay K 8644 increased phosphorylation of serine-880 (S880) on GluR2, whereas the nifedipine. tetrodotoxin and SKF96365 decreased S880 phosphorylation. Finally, we found that bisindolylmeimide I (GF 109203X, GFX), an inhibitor of protein kinase C (PKC) blocked both the decrease in cell-surface GluR2 and the increase in phospho-S880 induced by Aâ and Bay K 8644. Taken together, these results demonstrate that Aâ decreases cell-surface GluR2 by increasing PKC-mediated phosphorylation of S880. Our study supports the view that a rise in cytosolic [Ca2+]i induced by Aâ could impair synaptic function by decreasing the availability of AMPARs at the synapse. This decrease in AMPARs may contribute to the decline in cognitive function seen in AD.